real time marketing campaign data tracking dashboards : BAM! Direct, Inc.
What Is A Personalized URL? Personalized URL Marketing Provides Powerful On-line Response Channel for Direct Mail. Most direct mail campaigns neglect the large percentage of recipients who prefer to respond on-line. Sending them to a same-to-all corporate web site just isn’t good enough for today's web-savvy audience. Personalized URL Marketing engages these highly valuable prospects with their own VIP landing pages. Personalized URL Marketing is the technique of adding such a web address as one of the response channels on a direct mail piece and following it up with highly targeted VIP landing pages. When Christopher visits his personal landing pages, he finds exactly the information he expects based on the direct mail piece. He stays engaged and interested longer. He is more likely to buy. MindFireInc’s flagship product LookWho'Clicking® is the premier technology for Personalized URL Marketing. LookWho'Clicking® helps automate the creation and management of a personalized URL for every direct mail recipient, and dynamic VIP landing pages. The activity of each respondent is tracked and reported. Leads are automatically sent to the sales team for immediate follow-up. In today's world, it takes brilliant strategy as well as creative thinking to stand out in a super competitive marketplace. One way to incorporate both of these elements is via the use of real-time data tracking dashboards. With real-time tracking dashboards, information comes at you with the speed of light so you can stay a head of the game, as well as the competition. What's more, BAM! Direct can help you get started, taking the time to answer questions regarding marketing dashboard applications and use. BAM! Direct interface also includes an ROI dashboard which gives you priceless information regarding the performance of your marketing campaigns. Monitoring and tracking information has never been simpler and it literally does pay to invest in a response dashboard that can satisfy your growing business needs. The difference between a company that fails and one that succeeds is the willingness to do what it takes to move ahead of the pack. By investing in real-time tracking dashboards that gives you the ability to analyze data from a direct mail campaign, you can do just that. What's more, an ROI dashboard will let you Assess your progress, increasing chances of marketing success. When it comes to state of the art, no hassle, database management, a BAM! Direct response dashboard fits the bill and will become a perfect accompaniment to your marketing arsenal. Contact us today to discuss how to advantages of our cross media marketing campaign ROI dashboard. Increase Response Rates of Personalized Cross Media Marketing Campaigns Direct Marketing Assoc. Test it, Measure it. Know what works. 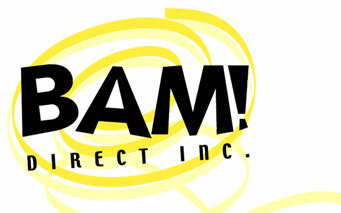 © 1999 BAM! Direct, Inc. All rights reserved.